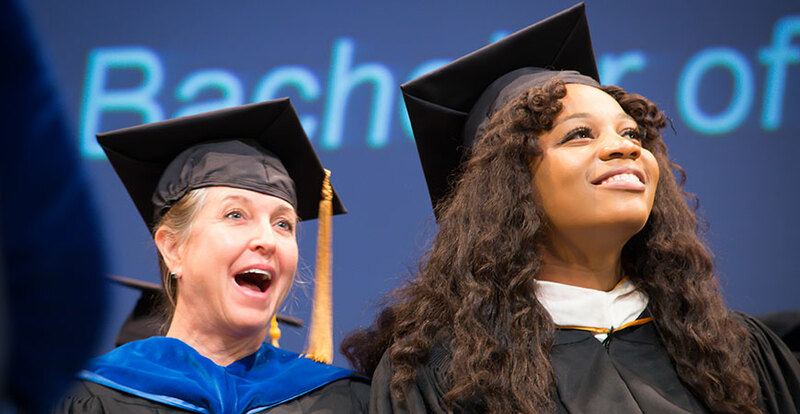 Class of 2012 alumna Shavone Charles, right, returned to UC Merced to deliver the keynote speech during the campus's first fall commencement. More than 80 undergraduate and graduate students gathered in downtown Merced on Dec. 16 for UC Merced’s first-ever Fall Commencement. 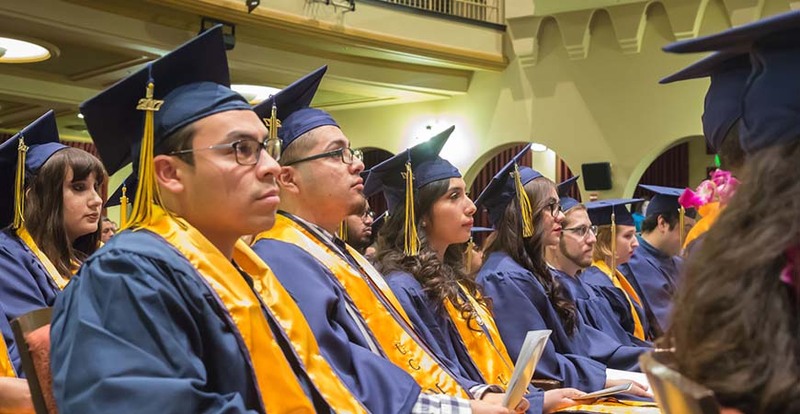 Graduates — along with their family and friends, faculty and a score of staff volunteers — assembled for the ceremony, held at the Art Kamangar Center at the Merced Theatre. More than 700 people filled the venue’s lower and upper levels. “Pomp and Circumstance” filled the air as the graduates — led by Chancellor Dorothy Leland and her platform party of distinguished guests, faculty members and administrators — entered the theater during the processional. Provost and Executive Vice Chancellor Tom Peterson offered the first remarks to graduates and guests before he welcomed Leland to the lectern. ”You’re the reason that we do the work that we do, and you inspire us every single day,” Leland said. “I routinely hear from faculty and others that UC Merced students are among the most passionate, dedicated and motivated students they’ve ever worked with. You are all pioneers, helping to build a culture of inquiry, discovery and learning that will last for generations. More than 80 graduates and their families attended the ceremony held in downtown Merced. The new graduates bring UC Merced’s alumni total to more than 8,000, which now surpasses the number of current students. In addition to the campus hosting its first Fall Commencement, the ceremony marked another first. Shavone Charles (’12) became the first alumna to give the campus’s commencement keynote address. The San Diego native graduated from UC Merced with a bachelor’s degree in Literature and Cultures after completing internships at Google, BET Networks, Twitter, Capitol Hill and the U.S. Department of Justice. Charles currently leads Instagram’s music and youth culture communications at Facebook’s office in Los Angeles, becoming one of the first African-American women to join Instagram’s communications team. UC Merced hosted the ceremony in the city’s growing downtown area, which will soon be home to the university’s Downtown Campus Center. Nearly 300 administrative staff will work in the three-story building at 18th and N streets, further strengthening ties between the community and the campus. "I’m here today to tell you not to hope for change, be the change. Create change through the way you live and use everything you’ve gained throughout your journey here at UC Merced to do good out in the world."